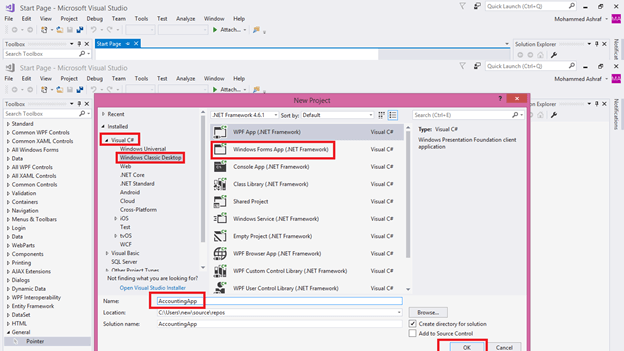 In this article, you will learn to create an Accounting Application with a C# Tutorial. According to Aspiring Minds National Employability Report, which is based on a study of more than 1,500,000 engineering students who graduated in 2015 from over 650 colleges, 80% of them are unemployable. Over 1.5 million engineering students graduate every year in India. This makes it difficult for everyone to get a job. I think self-employment is a good solution for this crisis. The creation of useful applications for mobile, web and desktop is a good choice for earning money. In this article series, I intend to disclose my Windows desktop accounting software creation experience for you. To know more about the accounting application I have made, please click on the link. To create an accounting application we need to know something about accounting. The foundation of accounting is Debit and Credit -- debt comes in and credit goes out. For example, we are purchasing furniture for our company office by paying cash of Rs. 500. So, debit Rs. 500 in the furniture account and credit the same in the cash account. The value of the furniture is increased by the addition of Rs. 500 and at the same time the amount of cash in hand is decreased by paying Rs. 500. 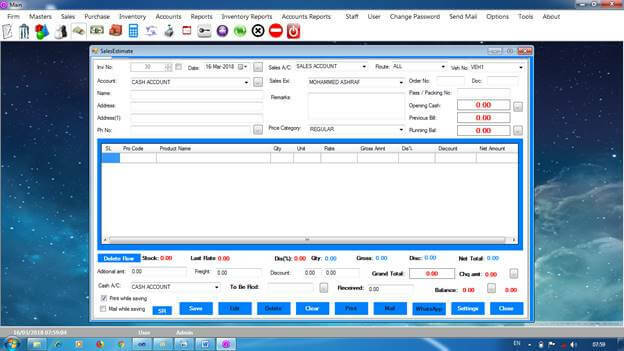 In accounting applications, all transactions are in voucher type. In a voucher table normally there are the followings columns. In here, we want to create two voucher entries. Please note that for every accounting transaction there will be two accounts. So we want two entries. This is the basic idea. But we have to mention in detail about ledger group, ledger account, trading account, profit and loss account and balance sheet, etc. In the coming chapters, we will cover all these accounting topics. Also, we have to mention about Inventory. In accounting, maintaining inventory is important. Products and services are Inventory. There are two types of products, manufacturing products and purchased products. We want to make an entry to maintain the stock of the product. That is, when we sell one product to a person there are two types of entries. Beside the accounting entry we want to make an Inventory entry. Earlier, we have seen that in accounting, all transactions are in voucher type. Normally there will be the following columns for Inventory Transaction Table. By giving the format of the table, I think you will understand about an inventory type transaction. In the case of the purchase, the stock of that particular product is increasing. At the same time in the case of a sale, the stock of such a product is decreasing. For example, I am a local dealer of Chairs. I am selling a Chair to a person. Then the following entry will happen. We have mentioned two types of tables for understanding the basics of accounting entries. In an accounting application, we have to create more than 25 tables. We have discussed about accounting, now we can go to the development section. 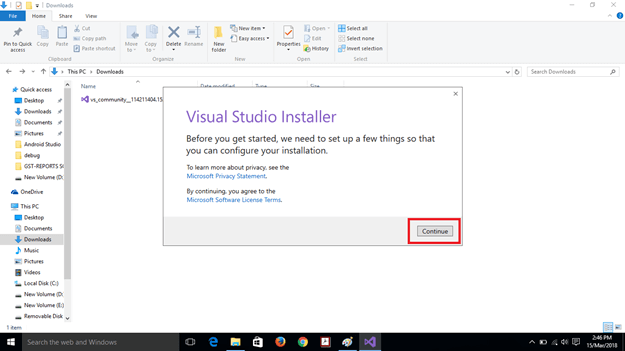 Firstly, we want to download Visual Studio. 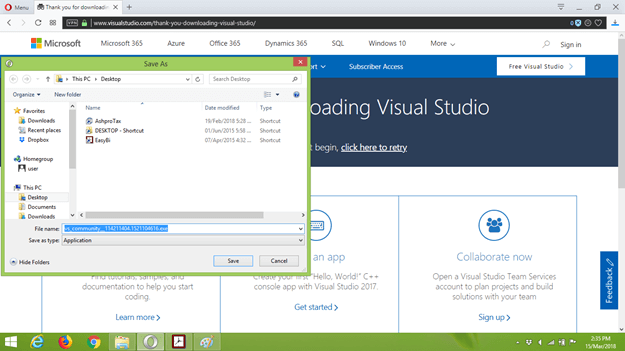 I am using Visual Studio 2010. But the latest version is Visual Studio 2017. You can download the community edition for free. 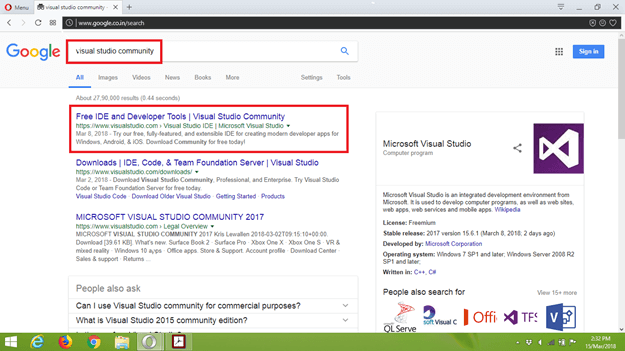 Let us type ‘Visual Studio Community’ in the Google search bar and then double click on the first link. Then we can see the download page. Click the download button. 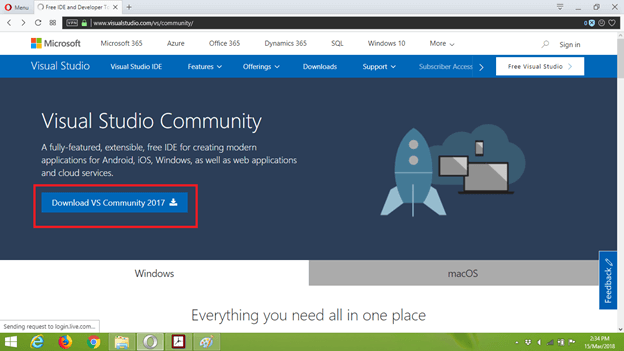 Now, the download of Visual Studio Community Installer will start. You can save the file to the Download folder or somewhere else you want. 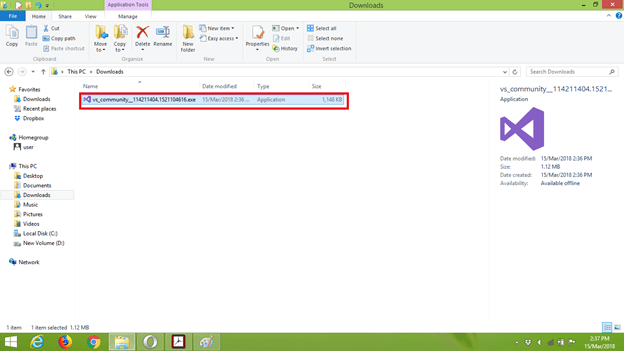 If the download process is completed, you can see the file in the download file. To start the installation, double-click on the file. 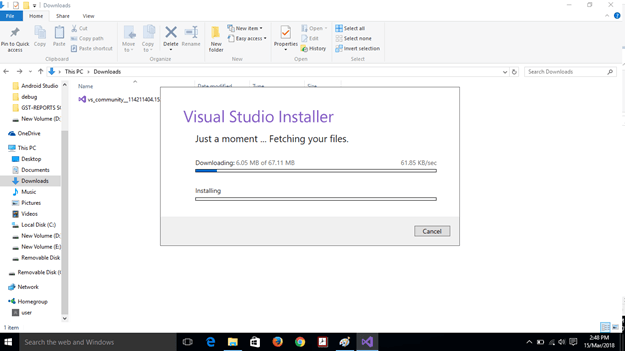 Then the Visual Studio Installer window will open. There are many options for installation. If you are a cross-platform mobile developer you can put a tick on Xamarin. 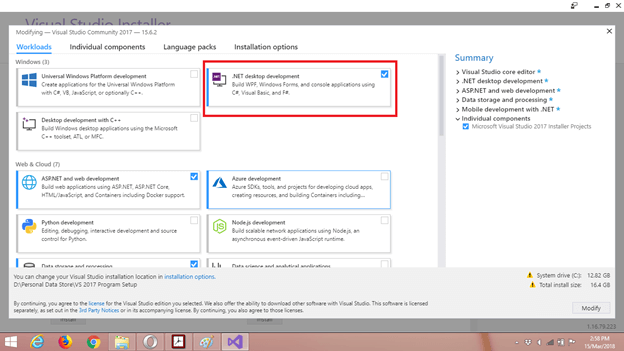 And web developers can select Asp.net development option. Here for us, we have to select two categories. One is “.Net Desktop Development” and the second is “Data Storage and Processing”. We select .Net Desktop Development for Windows Form Application development purposes. In this platform, we will develop our Accounting Application with C# programing language. 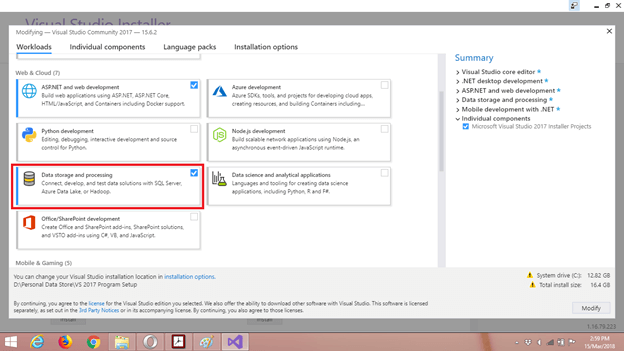 We want to store our data in SQL Server. So, we also select Data Storage and Processing option. Now the project window will open. 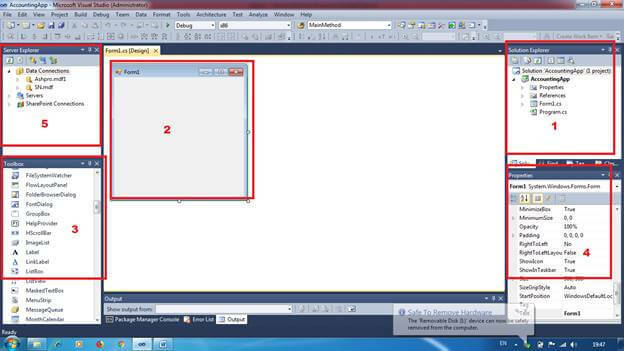 Select C# programming language, then Windows Classic Desktop and finally select Windows Forms App. In the name section, you can type any name you want. And then press the ‘OK’ button. Now we can see the window where all the application development process is happening. I have marked five areas. 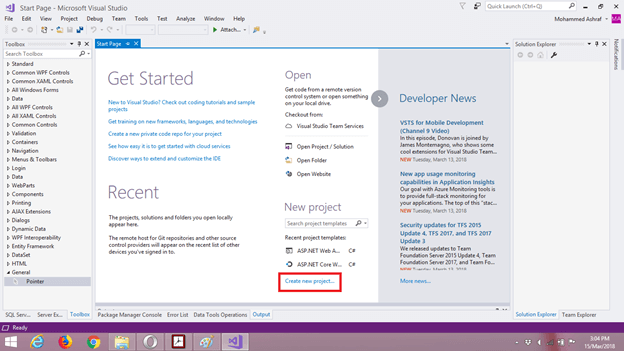 All are important in visual studio. This is the interface of our application. Here we create our application. From here we can drag and drop controls like button label and textboxes to the GUI to create the application. From here, we can change properties of controls in the Graphic User Interface. In here we can see the server and databases we use in the application. Referring to the projects I have made will help you to understand the lessons completely. If you want them, please email me at: ashpro2013@gmail.com.